In 2010, Mazda inaugurated a new design philosophy: KODO – Soul of Motion. To us, a car is more than just a means of transport or a mass of metal. It should be a vital presence in people’s lives, like a friend or family member. That’s why the KODO design philosophy is all about breathing life into the very form of our cars. Mazda has captured the energy found in the frame-by-frame dynamism of living creatures as they move, and infused this energy and rhythm into the form of our vehicles, creating cars with a vitality that makes them truly alive. This is our philosophy – an all-encompassing vision that we intend to carry forward and develop into the future as an ongoing tradition. We will need to develop our aesthetic style still further if we are to continue these values into the future. For the coming generation of Mazda vehicles, we are creating a look that is even more elegant than anything seen before, yet with the sense of vitality that characterizes the Mazda style. We have set out a design philosophy which encapsulates a distinctively Japanese kind of beauty – a style cultivated since ancient times as a look that is sublime yet subtle. The Mazda look is not “Japonism” in a simple sense; it is about reinterpreting the very essence flowing from the fundamental elements of Japanese aesthetics, and expressing this as a new kind of elegance. Our goal: the pursuit of a unique elegance. This is the theme of Mazda’s Design Forum this year. The elegance that Mazda seeks to express traces its heritage right through classic Japanese aesthetics – a beauty that is subtle and restrained, yet rich and abundant. Superfluous elements are carefully eliminated until only that which is essential remains. In this style, a sense of richness emanates from something that appears deceptively simple in design. 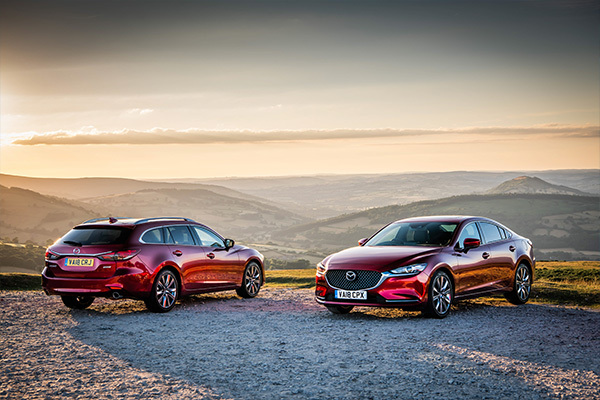 A car with a dignified presence, yet with a subtle yet pervasive allure that shines through; in the coming generation of Mazda cars, we aim to express our own unique vision of elegance as part of this image. The Japanese aesthetic typically expresses a kind of elegance that is found nowhere else. This could be described as a style which grows out of an exquisite sense of balance – beautifully restrained, with nothing overemphasized. Much of Japanese traditional culture is based on the minimalist concept of “less is more”, where the emphasis is on removing or minimizing elements to create an abundance of empty space. In our current line-up, we have captured the frame-by-frame dynamism of a living creature and translated this directly into the physical form of each car to create a look of vitality; going forward, however, we plan to focus on showcasing the bodywork of our cars through an ever-changing interplay of light and shadow that glides over the surface as the viewing angle changes, creating cars that look truly alive. Our mission here is to craft a form that is beautifully simple, with all superfluous elements stripped away, and then breathe life into this creation through an exquisitely honed display of light across its body. Looking back through our design history, the starting point for “Mazda elegance” is perhaps represented by the 1960 Mazda R360 and the 1969 Mazda Luce rotary coupe. In an age preoccupied with the notion of efficiency, the focus of these models was on creating beautiful proportions. Though the playful allure of these cars ran counter to the general trends of this period, this style was ultimately to become the origins of the “Mazda elegance” of today. The Mazda VISION COUPE is a next-generation design vision model which showcases the “new elegance” that we have developed, drawing upon Mazda’s long history of design. The name of the car – “COUPE” – gives a hint of where this special “Mazda elegance” originally came from. In this model, we have sought to create a beauty that’s special to cars – with a cabin further to the back and forming a single smooth line, based on the “golden ratio” of classic coupe proportions. The silhouette creates the feel of a high-performance machine, with a hint of powerful forward momentum. In creating the form of the body, the focus has been on stripping away everything that is unnecessary. The sense of rhythm and movement displayed by Mazda cars in recent years has been transformed into a simple three-dimensional shape that aims to embody a “less is more” aesthetic. From the Mazda badge on the front to the badge on the back, a single powerful axis runs right through the car, evoking the look and feel of supple steel, with all the car’s movements centering on this central vector. The result is a form that is extraordinarily simple yet full of a sense of latent speed: the “one motion form” that is the outstanding feature of this model. Having created a four-door coupe as our basic framework, we have invested tremendous time and care on the bodywork, especially the play of light across its surface. Infusing life into the body of the car: this is the core concept of KODO design. But expressing this sense of vitality can be achieved in a number of different ways. Bringing out the beauty of natural phenomena through exquisite, ever-changing patterns of light is an aesthetic that is unique to the art of Japan. A living drama is created from the dance of light and shadow as they change from moment to moment, and the Japanese are particularly attuned to these delicate transformations. This interplay of light and shade, together with the notion of “the beauty of empty space,” has been incorporated into the side view of this model. The reflection of light over the surface flows linearly with the movement of the car, creating a vehicle that seems truly alive. 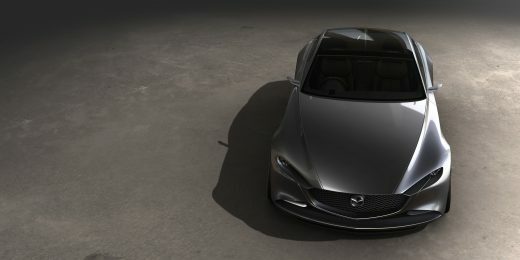 The predominant highlight on the body shoulder is strong and sharply-styled, emphasizing a powerful physique, while softer, more elegant light patterns shimmer across the empty spaces extending over the vehicle; the combination of these two different light effects brings the Mazda VISION COUPE truly to life. The light that dances across this beautiful form, brought to perfection over the course of two years by craftsmen working by hand, takes this bodywork to the level of art. We have aimed to create an interior that allows occupants to feel safely ensconced in the cabin without any sense of confinement, creating a sense of oneness between the car and those who travel in it. In configuring this interior, we have applied the concept of ma (literally ”space”), a distinguishing feature of traditional Japanese architecture, to create an interior that maintains a feeling of connection with the outside world. The impression is of a space that reaches ahead as the car navigates the road. The interior of the Mazda VISION COUPE, just like its exterior, has a satisfyingly deep and three-dimensional feel; its lines run smoothly from front to back, exuding a sense of speed. Structural forms such as the centre console, door trim and instrument panel intersect with one another without touching, creating a sense of ma inside the car. The spaces that are created encourage the flow of air throughout the car, and the three-dimensional framework makes occupants feel safely ensconced without any sense of confinement. In recent times, car interiors have come to be dominated by large displays. Although considerable amounts of information need to be supplied to the person operating the car, these screens can easily become a barrier that blocks the driver’s view. This model features a see-through screen developed by Mazda; it functions as a display only at those times when it is required, creating an interior space with perfect visibility for the driver’s needs. 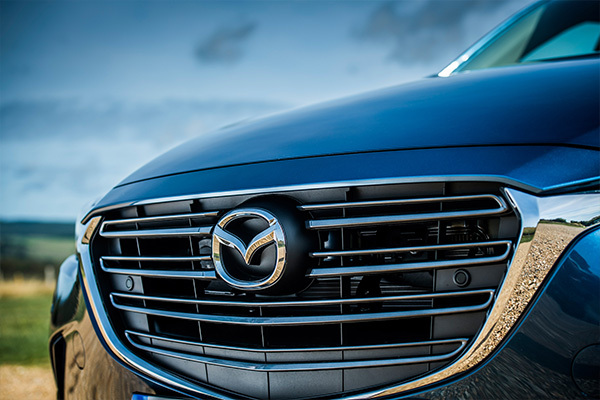 At Mazda, we feel that car and driver should have a bond like that seen between a horse and its rider. 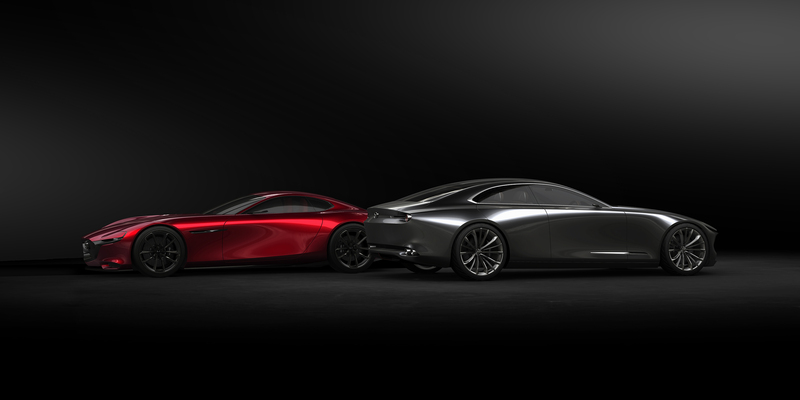 This is the Jinba Ittai concept, an idea that lies at the heart of Mazda’s vehicle design. Based on this vision, we have been investigating new operational methods that minimize the gap between the driver and the vehicle space – allowing the driver to operate the car intuitively, as though it were an extension of his or her own body. In the Mazda VISION COUPE, the cockpit layout is symmetrical, with the steering centre in the middle and everything else to the left and right, meaning that the driver can sense the central axis of the car at all times. The Jinba Ittai ideal of intuitive operation has also been brought into the controls. Drivers can bring up information with a quick touch of the centre console, like a jockey stroking the neck of his or her horse. This and other controls seek to create a unique human-machine interface that intuitively connects car and driver. This is, then, what is meant by the Jinba Ittai concept. The preeminent trend of modern times is the urge to maximize efficiency in every way. While the current shift towards automated driving is sure to create new value for society, we at Mazda have concerns that this could also weaken the bond that exists between humans and cars – the interaction between the driver and the vehicle he or she operates. Given current technological trends, we believe it is vital that cars retain their intimate positions in the lives of their drivers – almost like a member of the family. What’s more, we intend to work still harder to bring out the special beauty and appeal of cars themselves. A form created by applying the vision of Japanese aesthetics, beautiful and refined yet exuding a sense of warmth – a comfortable space where humans can truly feel at one with the vehicle. This is the vision Mazda has in mind when we design our cars. The car we have in mind is the kind of car that can only come from Mazda, a brand embodying the emphasis that Japanese culture places on the bond between human beings and the tools they use. Creating cars that can do this is the challenge that drives Mazda Design.